Lieutenant Amherst wears the regimental pattern stable jacket. It is quite interesting to see the plain leather undress sabretache, as well as the booted overalls, that will be replaced by knee-high boots in 1871. The charger's throat ornament is white horse-hair, eighteen inches long, with brass ball and socket. 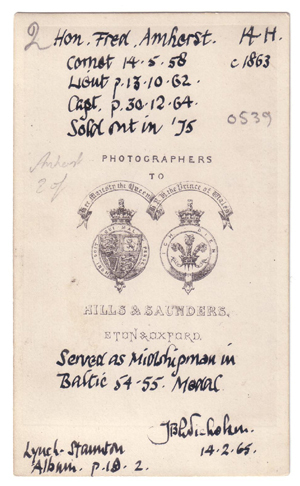 This photograph is yet another example, where the back of the photo provides most interesting information. First the identity of the sitter, along with details of his service. You'll note that he served in the Royal Navy, and the ribbon he is displaying on his chest is that of the Baltic Medal ! But we'll get back to his service later. What really got me interested is the last batch of annotations : "Lynch-Staunton Album. p.19.2" and "JB Nicholson 14.2.65". These two refer to a fascinating article written in Tradition Magazine n°14 (1965), where Colonel J.B. Nicholson describes the contents of a family photo album, attributed to the Lynch-Staunton family, and comprising Cartes-de-Visite photographs of most of the 14th Hussars officers in the 1860s (quite an extensive quantities of which are shown). The same image is reproduced in the article ; is it the actual item coming from that album ? Frederick Amherst was born on December 6th 1838, at Montreal, Sevenoaks, Kent, the second son of the second earl of Amherst. He started his career in the Royal Navy as stated above. On August 12th, 1851, it was announced at Portsmouth that "Messr. Amherst" had passed "at the monthly examination of young gentlemen for entry into Her Majesty's naval service as cadet". A month later, on September 10th, he was appointed as a Naval Cadet to the Rattler. That one didn't last long, as a mere...9 days later, the London Gazette announces the apppointment of "Frederick Amherst to the Rodney, 90, at Portsmouth". We know where and when he was serving ; let's look into the life of those ships. She was a 3d Rate sailing ship, 78 guns, launched on 16th October 1818. In Frederick Amherst's time on board she was commanded by Captain George Paulet. By the end of September 1851, she was taken into dock at Portsmouth, having been commissioned for five years. She "had her copper overhauled, and received about eight streaks of new copper from her water line downwards", and was taken out of dock on September 30th, and "hauled alongside the jetty for further refit". Meanwhile a Lieutenant of the Bellerophon had commissioned pro-temp. the Hercules,72, store and troop-ship, for navigation to Malta. On October 14th, the Bellerophon "rebent sails to-day. She will leave in a few days for the Mediterranean, convoying the Hercules to Malta to replace the Ceylon as a receiving ship". On the 17th, she "sailed out of harbour to Spithead to-day, saluting the flag of Admiral Sir Thomas Brigg, G.C.M.G., the Port Admiral". Both ships reached Gibraltar on November 2d, the Bellerophon being "8 days from Plymouth" and the Hercules "9 days from Portsmouth". On the very day of her arrival she sent boats to assist the British screw steamer Phoebe, than had "ran aground off the breakwater under the Orange Bastion, on coming into the bay during high water. (...) The men-of-war's boats had extended an anchor, and did everything that was possible to get her off, but could not succeed. A portion of the coals and cargo of the Phoebe was then discharged, and, by joint assistance of Her Majesty's steamer Janus and theNile, and the working of an anchor cast from one of Her Majesty's ships boats and worked on board the Phoebe, the succeeded in getting her off about 8 o'clock". The Hercules and Bellorophon arrived at Malta on November 21st. The Bellerophon joined the Mediterranean Squadron there. "By a letter from the Mediterranean to the 26th of December, we are informed of great discontent prevailing among the assistant surgeons of the squadron, owing to the arbitrary conduct of Sir William Pakrer in depriving sundry of them of their cabins, &c. Measles have broken out on board the Bellerophon, 78, Captain Lord Paulet, and liberty to go on shore is prohibited to her crew. at the date of our letter she had sent two subordinate officers and three boys, labouring under the disease, to Malta Hospital. A party of liberty-men attacked a sergeant of marines belonging to the depôt ship Hercules, who was on shore looking for a straggler, since which marine patrols have been furnished from the flag-ship Queen, and the Superb and Bellerophon, for the preservation of peace on shore by men on leave from the squadron. One of the men of the Queen was found dead under his mess-table on Christmas-day". On January the 24th, the ships at Malta having been ordered to get ready for sea, the "Bellerophon, Vengeance and Trafalgar got under weigh, the Admiral having struck his flag from the Vengeance, and hoisted it on board the Terrible steam-frigate". The three ships left Malta the same day on a cruise. On the 1st February, they suffered from a severe gale blowing on the Mediterranean : "it appears that all felt the gale severely, and that the loss of one has not to be reported seems almost miraculous. As the gale commenced, the Trafalgar in running up to her station ran into the Albion, but fortunately did but little damage ; she left a part of her jibboom on board, and has, it is said, sprung her foremast, and carried away the head of her rudder. The Vengeance has lost a gun, and the Bellerophon, it is also said, has sprung a mast. So much for a winter cruise". The Bellerophon rejoined Malta on February 9th, coming into port towed by the Terrible. The damage will eventually be thus assessed : "Bellerophon, foremast rotten". Overall the damage to the squadron was estimated at "not much less than 20,000l. sterling". "On Tuesday we had a regatta. On board the flag-ship and the Bellerophon several guests were invited, and finished the evening by a dance; On the Bellerophon a marine went to the maintopmast-head; on this one of the sailors, simply not to be out-done, ran up the rigging to the maintopmast-head, and thence mounted to the maintruck, where, standing, he coolly waved his hands and arms about, as fearlessly as if he had been on terra firma. He then undressed and dressed himself again, finishing his daring exploit by crawling down the backstays head-foremost, amid the prolonged and boisterous cheers, not only of his own messmates, but of the crews of the neighbouring ships. The feat was a most daring one (the main truck of the Bellerophon - I have it from Lord Paulett - not being more than a foot), and one perhaps that not ten men in the fleet could or would perform". On June 29th the Bellerophon arrived along the British Mediterranean squadron (under the orders of Rear-Admiral Dundas) at Gibraltar, where the marines of the different ships were landed and had a field-day, performing manual and platoon exercises under Lord George Paulet ; the bands of the Bellerophon and Vengance were in attendance, and played popular naval airs at the breaking of the battalion and embarcation. The whole event was much to the pleasure of the public of Gibraltar : "Altogether it was an extremely pleasing night (...) we are in hopes that, when the fleet pays us another visit, we shall have another 'field day' ". The squadron left on a cruise to the eastward on July 7th. By the 10th they had reached Malaga. By August the fleet - and the Bellerophon- were back at Malta, whence it "was to leave on the 16th for Smyrna". On the 14th of September, the Bellerophon was taken in tow by the Tiger when off Falconera. On December 16th, the Bellerophon was reported as "lying at anchor in Gibraltar Bay". She was still regularly reported there until January 16th. By March 14th the Bellerophon was back to Malta. It's quite likely that by that time, Naval Cadet Frederick Amherst had already made his way back to England. She was a 1st Rate sailing ship, 120 guns, launched on 10th June 1833. In Frederick Amherst's time on board she was commanded by Captain Montagu Stopford, and the flagship of Vice-Admiral Joscelin Percy at Sheerness. She was a 2nd Rate sailing ship, 90 guns, launched on 28th September 1840. In Frederick Amherst's time on board she was commanded by Captain Charles Eden. On August 26, 1853, the Hon. F. Amherst was appointed a Midshipman to the London, 90, at Portsmouth. So he missed out on the review of the fleet by the Queen, held at Spithead on August 11th. By August 26th : "The London, 90, Captain Charles Eden, has had her orders for foreign service countermanded. She will now join Rear-Admiral Corry's division of the Channel fleet, for which she will sail on Tuesday, most probably, as her paybooks were returned from the Admiralty this morning ; her crew will, therefore, most likely receive their wages on Monday, and then she is ready for sea. The paddlewheel steamfrigate Magicienne, 16, Captain Fisher, will attend upon her. Letters by this chance to Rear-Admiral Corry's squadron should be at the Port Admiral's office on Monday". "The cause of the delay is said to be the dead calm which prevails, but it is somewhat difficult how a steam fleet could be so dependent upon the wind. In consequence of directions received from the Admiralty, Mr. B.Verling, harbour-master, has cleared all the merchant shipping from the man-of-war roads, and they now lie anchored in a thick cluster along the shore of Queenstown, and in the direction of Aghads and the East Ferry. The ships arrived are two line-of-battle ships and a frigate. On Wednesday about 4 o'clock, the London, 90, Captain Eden, arrived ; yesterday the Imperieuse, screw, 50, Captain Watson, steamed in ; and this morning a salute of guns announced the arrival of the Blenheim, 60, Captain Zelham, answered from the Terrible, bearing the flag of the Admiral of the port. Upon the arrival of the latter vessel this morning, the sound of her guns as she came inside the harbour was almost the first notification that was had of her arrival. As soon as the squadron from Bantry shall be arrived, it is estimated the fleet will number 27 sail, line-of-battle ships and frigates. The squadron under Commodore Martin is expected to arrive first, and to be followed immediately, if not actually accompanied by,that under the command of Rear-Admiral Corry". On September 30th the whole fleet was outside Quenstown harbour all day in light winds. By October 3d Admiral Corry's division was "ordered to cruise between Queenstown and Scilly until the 15th inst., then to return to Spithead". That Channel affectation won't last long, and inthe afternoon of November 5th, the London sailed from Spithead from the Mediterranean. She arrived at Malta on November 27th, and left on December 2nd to join the fleet in the Bosphorus. This was a time of rising tension, as the the Russians had destroyed the Turkish squadron under Osman Pasha at Sinope, on November 30th, 1853. That attack infuriated the public opinion, and led to the active involvement of Great-Britain and France. "Britannia (flag), Agamemnon, Queen, Trafalgar, Albion, London, Rodney, Vengeance, Bellerophon, Sanspareil, Leander, and Arethusa. Steamers.-Terrible, Sampson, Firebrand, Fury, Inflexible, and Niger". Frederick Amherst was then very close to his former ship ! "On January 3 the combined fleets left Beikos Bay, but anchored again off Buyukdéré, as the Triton, with the mails, made her number, and the weather, which had been remarkably fine, changed to a thick mist with heavy squalls. The Sanspareil, Rodney, and Bayard had reached the rendezvous, 10 miles from the entrance to the Bosphorus, but were recalled. On the morning of the 4th the weather had cleared up-it was quite a calm- when the whole fleet weighed and assembled at the entrance of the Bosphorus. The ships formed in two columns : - Britannia and Ville de Paris, Albion and Jupiter, Veangeance and Jena, Sanspareil and Henri IV, Rodney and Valmy, Bellerophon and Charlemagne, London and Queen, and five French steamers and seven English ; Leander frigate looking out a-head. At 4,30 p.m. signal was made, "Turks are to be protected from all aggression by sea or land."" On friday 6th, the fleet anchored in Sinope Bay. "The ships are lying at Beicos Bay, both English and French. At the mouth of the Bosphorus, with seven Turkish line-of-battle ships and five frigates, guarding the entrance to the Black Sea, are the Agamemnon, London, Sanspareil, and Highflyer. The Niger is at Therapia ; the Retribution at the Golden Horn, with Turkish and French vessels, embarking troops and ammunition for Batoum. Our steam fleet is to convoy the Turks, Sir E. Lyons in command. His flag is in the Agamemnon, a splendid vessel, and heavily armed. All the vessels double shot their guns at sunset, and Moorsom's shells lie conveniently handy behind them." The next month Frederick Amherst's service on board the Bellerophon would come to an end, and he likely left the ship just before the beginning of the war with Russia - declared on March 27th 1854. She was a 1st Rate sailing ship, 120 guns, launched on 22d September 1827, that had been converted to screw on June 22d 1853. In Frederick Amherst's time on board she was commanded by Captain Henry John Codrington. The Royal George was already at sea among the Baltic Fleet when Midshipman Frederick Amherst joined her. As a matter of fact she had sailed from Spithead on March 11th. Commanded by Vice-Admiral Sir Charles Napier, the Fleet reached Wingo Sound, off Sweden, by March 19th, anchoring off Kiel by the 27th. The fleet then reached Kjöge Bayon April 12th. On the April 16th, the battleships, among which was the Royal George, left towards Hangö and Sweaborg. What about Frederick Amherst will you ask ? Reinforcements were brought in, and for instance, it was reported, that on May 15th, "the steam-frigate Penelope, 30 guns, arrived (in Copenhagen) with 60 officers and 30 midshipmen, for distribution among the fleet". "A melancholy circumstance has occured on board the Royal George, 120. Lieutenant H.Freeland, the junior subaltern of the Royal Marines was found dead in his bed on the morning of the 25th ult., although on the previous night he retired to his cabin in perfect health. His death wascaused by a sudden attack of epilepsy, from fits of which he had prevously suffered. The Royal George and Caesar ran into each other during the night of the 19th. Fortunately, the only damage sustained by the collision was the staving in of their respective quarter-boats. Charts of the Gulf of Bothnia have been supplied to the various ships. (...)"
The fleet sailed for some days "in the vicinity of the Island of Gottska-Sandoe". After receiving provisions from the transport Holyrood, the fleet proceeded in a northward direction on May 16th. "On the 17th Rear-Admiral Corry was detached from the fleet on particular service, taking under his orders the weather column, comprising his flagship the Neptune, 120 ; Monarch, 84 ; Boscawen,70 ; Prince Regent, 90; and Cmberland, 70; together with the James Watt, 91, of the center column; the Royal George, 120, and the Ajax, 58, of the lee column". By June 13th the French fleet joined the British one and anchored in Baro sound. The combined fleet moved next towards Cronstadt : "On the morning of the 22d inst., the rear squadron of the English division, under the orders of Rear-Admiral Chads - comprising the Edinburgh, 58, 58, Captain Hewlett ; Cressy, 80, Captain R.L.Warren ; Caesar, 91,Captain J. Robb; Royal George, 120, Captain Codrington ; Nile, 91, Commodore Martin, C.B. ; and Majestic, 80, Captain James Hope, C.B.- steamed out of Baro sound, followed by the centre squadron (...)". By the 24th the fleet was at anchor off Seskar. Some ships were detached to look out for dreaded floating "infernal machines" (a threat that did not materialize bythen), and by the 29th, most of the fleet (iincluding the Royal George) was anchored "about 10 miles to the westward of Cronstadt". "The retrograde movement from Cronstadt was most unexpected ; but most probably was made by the view of arresting the progress of the epidemic which prevailed in most of the ships, and which upto the present date, the 7th, although it has in many instances assumed a milder form, has not yet ceased its ravages. Some fatal cases on board the Majestic and Royal George have taken place within the last two days. (...)". Cholera had indeed broken out in the fleet, that went to anchor in Baro Sound (West of Sweaborg, still in the Gulf of Finland), on July 6th. On July 13th, the fleet departed from Baro Sound, the English fleet forming order on reaching the offing, the Royal George taking place in the Lee Line. On the 21st inst. the whole of the English ships were ordered to prepare for sailing, but the ordered was annulled for part of the ships, including the Royal George. Those formed order of sailing under Commodore Martin's orders the next day, the Royal George taking place in the Port Division, and sailed towards Hango. 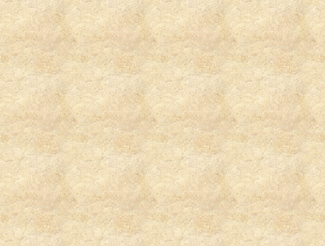 the island was sighted on the morning of the 24th. Some excitement happened, as "the Royal George was ordered to proceed in chase of a schooner which appeared in the offing. On boarding her, she proved to be a Danish trader Anette Cathrina, from London, laden with supplies of various descriptions for private sale to the fleet". Commodore Martin's division then blockaded Revel and Port Baltic. "A most melancholy accident has occured to lieutenant Bond, of the Royal George. He was on shore with some of his messmates, one of whom, a subaltern of marines, had a revolver, which was accidentally discharged, the contents lodging in the side of Lieutenant Bond, injuring the spine, thereby causing paralysis of the lower extremities. The unfortunate officer was conveyed on board his ship with all possible despatch,but surgical aid proved unavailing, and, after forty-eight hours' intense suffering, he breathed his last, and was buried on the forenoon of the 10th inst. at Nargen." "The boats of the fleet had been engaged laying down buoys, taking bearings and distaces preparatory to an attackbeing made on Revel. They were only waiting for Sir Charles Napier". On the day before a medical survey had been holden on board the Royal George, and "several patients were invalided, and transferred to the steam transport Holyrood, for passage to England" - where they arrived on September 26th. Meanwhile by the 21st the squadron and the Royal george were still reported as anchored at Revel Bay. Winter looming in, Napier sent the fleet to Kiel on September 27th - only to be sent on October 4th an order of the Admiralty intimating him to consider an attack on Sweaborg. That order was partly given to please a public opinion eager for more action. The Royal George reached Kiel harbour -where the fleet gathered- on October 26th, whence some sick patients were invalided and transferred to the Rhadamanthus steam sloop for passage to England. The Times of October 28th announces : "The period at which it is essential as a matter of safety for the fleet to withdraw from the insecure anchorages in the gulf of Finland has arrived. During the heavy gales which have recently prevailed, although the ships have sustained no particular damage, yet many of them have lost their anchors and cables. Their proceeding to some safe harbour until the formation of the ice compels them to withdraw altogether from the enemy's coasts is now both prudent and necessary." The Royal George was first appointed to winter at Plymouth. It was then announced that the Royal George's orders to proceed home had been countermanded, and that she was to go to Cherbourg to embark troops for the Black Sea. By early December, it was announced that she was "ordered to Cork, to embark 600 rank and file and 100 tons of stores for the Black Sea". That the matter should have been made the subject of a public inquiry is much to be regretted, if it should tend to decrease that good feeling which it is essential to preserve between the officers of the navy and the Royal Marine corp."
The chief division of the English fleet eventually left Kiel on December 7th, the Royal George being ordered to proceed to Sheerness. She reached the Great Nore on December 18th at 11:30 a.m. : "she saluted the Commander-in-Chief's flag, and anchored there, the wind at the time blowing a strong gale, with the barometer down to 23.35, with heavy rain. Moorings are ready prepared for her when the weather permits her making the harbour". She took up "moorings on the south shore up Sheerness harbour, near Blackstakes" on the 20th. Two days before Napier had reported to the Admiralty, where after heated exchanges he was asked to strike his flag. The Royal George had taken no active part in the few actions and raids conducted by the fleet - one has to consider that a ship-of-the-line is not the best suited for action in gulfs and sounds. The objective though of blockading the Russian fleet was achieved. "It is ordered that the crews of (...) (the) Royal George are to be paid wages due to them to-day, if possible. (...). The Royal George is ordered to be cut don to a two-decker, in consequence of her rolling propensities at sea. During the time she has been out she has had to send her lower deck guns down in the hold to stiffen her, and even when the crew have all been at general quaretrs, on their shifting over fromside to side, she has taken from six to seven degrees' careen over. For greater convenience, it is expected that all her guns will be put on board some of the ships now lying at Sheerness in ordinary, to facilitate their being taken on board again when she has been made ready to receive them. she will hereafter carry all her guns of the heaviest calibre, with the large swivel traversing pivot-guns, of 95cwt., on her upper deck". So much for her transporting troops to the Crimea ! On December 23d, she "steamed down to the docking moorings, where she will remain until next spring tides. Her crew have (...) leave (...)". On January 1st 1855, it was announced that part of the crew of the Royal George was to be draughted to the Nankin, "on their return from their leave on the 16th inst.". On January 3rd it was announced that her crew was "to be hulked on board the Wellington, ordinary victualling depot." That day she was "warped into the fitting basin, Sherness (...) The shipwrights are busily taking her poop deck off." On January 5th the order to convert the Wellington to a hulk for the crew of the Royal George was naturally "countermanded, and the Bentow, receiving ship for Russian prisoners of war, is ordered to be paid off, and the crew of the Royal George are to change over to her to-day. The Admiralty have decided on taking all the upperdeck guns out of this ship,and she will in the future carry two pivot traversing guns (Lancaster's improved) on her upper flush deck. She will then be what is technically called a three-deck ship with all the men housed in time of action". Prospects of another campaign prompted to the hastening of the works, and The Times annouced on February 3rd : "A number of additionnal artificers, &c., have been put on the Royal George, 120 guns, and the Majestic, 80 guns, to expedite their equipment by the 1st of March". On February 15th : "The Royal George,120, is now all-a-taunt in No.1 dry dock, Sheerness, and the last act is being performed, -viz. refitting lower and topmast and topgallant ratlines". On February 26th, the fleet to be despatched to the Baltic was announced, now under the command of "Rear-Admiral of the Blue, the Hon. Richard Saundars Dundas, C.B." ; for the first time the Royal George was now qualified as "102". The Royal George was under orders to be at Spithead by the 4th of March, but it was reported on the next day that "in consequence of the waste-pipe in the starboard side bursting, she is to leave to-day. In every other respect she is ready for immediate service, having shells, ammunition, &c., on board". She eventually left Sheerness on March 8th, "under steam power, at 2.30 p.m., for Portsmouth, having repaired the deffect and damage to her starboard waste pipe". "The Royal George, 102, screw ship, Captain Codrington, C.B., arrived at Spithead yesterday, from the Nore, and joined the fleet". It would still take some time for the fleet to sail to the Baltic ; meanwhile the ships stayed at anchor at Spithead, the Royal George being moored "West - Looking East". "This afternoon the shores of the Solent will witness one of the great spectacles in which England is once more at home. A portion of the fleet, consisting of more than thirty vessels of war, and including a dozen sail of the line, will start to occupy the Baltic,to blockade every inlet and port of the CZAR, and, if possible, find some vulnerable point of his triple granite and iron. At any time the sight of so many huge machines, sent out with the message to kill and destroy, may well subdue the most frivolous. even a naval review, with its mimic thunders and its programme of triumphs, becomes a scene of horror exactly in proportion as we realize its true import. What we may see to-day, however, is ambitiously and industriously grander, sterner, grimmer, more real, and more deadly, than any like spectacle on these or any seas. The Baltic fleet of this year is in all respects much stronger than the last ; it has more steam power, more guns, a new class of gunboats and floating batteries, adapted for creeks and shoals, and, what more than anything marks a resolution to do something - a new commander.Sir CHARLES NAPIER has ceased to command the Baltic fleet, not from any deficiency in skill, in courage, or temper, but simply because he did less than the British people expected to see done. We have ourselves been ever ready to do justice to his actual achievements, which are not to be denied or depreciated ; but, when we send out the finestfleet in the world, we naturally expect it to do more than shut in a third-rate naval Power, and assist an army to destroy an unfinished fort. The new commander,Admiral DUNDAS, has before him the services of Admiral NAPIER, and, whatever his instructions, if any, no doubt he knows that he has to do more than Admiral NAPIER. If he does not accomplish more, he will certainly find himself next November ordered to lower his flag, with small prospect of ever hoisting it again. Such is the mission of the fleet the QUEEN sends this day on its fatal errand. It is to attempt more, to run more risk, to follow further and closer, to care less for losing ships and men, and rather more for inflicting losses and disgraces on the enemy. In a word the force is stronger and the duty more terrible than last year ; and if the scene to-day should attract a smaller crowd of gazers than last year, they will doubtless see it less as a hollyday spectacle, and more as an operation of war. We certainly had wished that after last year's experience we should have less of such floating castles as the Duke of Wellington and the Royal George, and rather more of the gunboats and other small craft, on which we must mainly rely in our offensive operations. (...) Without inquiry, and, as a matter of course, we have been making our ships larger and larger, when inquiry might have suggested that they should have been smaller and smaller. Were it, indeed, the waves alone we had to deal with, could we fight out every quarrel on the wide ocean, had we always to chase huge fleets from one hemisphere to another, and fight over again for ever,as in the old mythology, every battle ever fought with American frigate or Spanish three-decker, there is no doubt as to the excellence of the type we seem to have adopted. But the actual state of things is far otherwise. Like some strong impetuous animal, we seem to miss our object by running ahead of it. We have to deal with shallow waters and granite walls, and find ourselves too gigantic for the petty warfare, and, giants though we are, we are so far baffled. No doubt we have improved on last year ; but,unless there is a large supply of the smaller craft, adapted for the shallow waters of the Baltic, we shall only reiterate an inglorious campaign with even less glory than before. (...)"
On April 17th we learn that "the Thistle gunboat, Lieutenant D. Spain, tender to the Royal George, has arrived at Sheerness, from Greenhithe, to wait orders", and that "the Phoenix screw steamloop, Commander John M. hayes, has left Sheerness for the Baltic direct, taking under her charge for towing, as required, the Starling gunboat, tender to the Royal George, and the Redwing gunboat, tender to the Nile". The fleet left the Downs at 7 a.m. on April 9th, "under plain sail with a moderate breeze from the W.N.W. quarter, each ship weighing anchor in the order denoted by signal from the flagship of theCommander-in-Chief". The Royal George took place in the Weather Division of the fleet - each division being preceded by a paddle-steamer. After a voyage qualified as "not (...) remarkable for any features of peculiar interest", the fleet, on April 19th, "came in sight of Kiel harbour (...), in the forenoon, and by 3 o'clock in the afternoon they had all anchored off Bellevue. (...) The Nile and the Royal George were the first to cast anchor, when the English and French Consuls went on board the former ; they were received with a salute of seven guns." "The same evening that the fleet arrived many officers came ashore on leave for 12 hours; and the following day, after the men had had their dinners, they flocked into the town in still greater numbers." The fleet was still "lying quietly in Kiel harbour" on the 22d, the Royal George lying "the nearest to the town". "The part of the Baltic fleet collected at Kiel, consisting of the Duke of Wellignton, bearing the flag of the Commander-in-Chief, the Exmouth, with the flag of Admiral Seymour, second in command, the Nile, the Royal George, Cressy, Caesar, Blenheim, James Watt,Ajax, Hogue, Edinburgh, Majestic, Colossus, Merlin, Lightning, Locnat, and two gunboats in tow of the Dragon, left that secure harbour on the morning of the 3d, and proceeded, under steam, down the beautiful inlet, with the land on either side covered with woods and green fields, like the banks of a river. By 9 a.m. we had reached the open sea, and the flagship made a signal to form in two columns of sailing, which soon stretched their lengths across the water almost from horizon to horizon. When this was done another signal unfurled itself- "Stop steaming, up screws, and try rate of sailing, carrying all possible sail." There was very little wind, and even that died away in about an hour, leaving us motionless ; so we were obliged to furl our sails and commence steaming again. After steering due east until 3 p.m., the course was altered to east-south-east, and, in case any ship should by accident part company with the rest during the night, a rendezvous was appointed 10 miles east of Faro lighthouse. In the evening the Conflict arrived with despatches from the advanced squadron for the Commander-in-Chief. The squadron is cruising between Port-Baltic and Dagerort. The Conflict reports the Gulf of Finland almost free of ice as far up as Baro Sound, and that it is rapidly breaking up beyond that. At 5 a.m. on the 4th,after being under easy steam all night, a fine, but bitterly cold, breeze sprang up from the north. The engines were again stopped and all sails made, but the poor blochships were being so left behind they were obliged to have recourse to their screws for assistance, and even then kept station with the rest with difficulty. At 9 30 a.m. the fleet went to general quarters for exercise - it is always the custom of the service to do so on Friday mornings. Each ship fired at the same time, the two columns appeared to be engaging each other, forming a magnificent spectacle which threw Spithead reviews into the shade. By 11 o'clock the wind had again nearly forsaken us, and the little that remained was getting adverse, so the Flag signallized "Get up steam, fur sails, and alter course to E.N.E." At 3 p.m. we came in sight of the pretty little island of Bornholm, and passed between it and the main-land before sunset. May 5.- Saturday, on board a man-of-war, is the most uncomfortable of all uncomfortable days. Like in all well-conducted houses on shore, it is a day given up to general cleaning ; the men discard their shoes and stockings, tuck up their trousers over their knees,and at early dawn commence such ascrub, wash, and holystoning, as cannot be seen anywhere else. The discomfort complained of by the Scotch bard on a washing day was insignificant compared to a Saturday forenoon on board a ship; he could get outside the house into the fields to growl and escape the noise and splash, but here you can't escape - everybody growls, everybody grumbles, even the dull sound of the holystones makes you believe they are grumbling too. Every one tries to hide himself away, for, should any unhappy "dry iddler" have the temerity to trust himself on a deck, he is sure to come in the way of a hose like a fire engine's, accidentally pointed that way at the moment, while the man holding it begs his pardon with a broad grin, and tips a sly wink to his messmates, or he will have a shower-bath over his shoulders through the gratings of the deck above, and the satisfaction of hearing (rather late) a warning to those below to get out of the way. We had been under steam all night, and about mid-day came in sight of the lighthouse on the south point of the island of Gothland,along the east side of which we passed,and anchored on Sunday morning, at 9 30 a.m., about five miles from Faro, the blockships Edinburgh, Blenheim, Hogue, and Ajax going into the harbour, while the others remained outside. The Caesar's engines broke down in the morning, and she was ordered to cruise about under sail until they were repaired, as it would be dangerous for her to be caught among these shoals and rocksby any gale if she anchored, unless they were in order. We found lying here eight or ten colliers, seven gunboats, the Arrogant (with about 20 cases of smallpox), the Desperate, the Magicienne, the Cuckoo, and the Princess Royal. The latter has met with a sad accident, which was nearly sending her to the bottom. She ran upon a rock going into Faro harbour. She got off with some difficulty, and lashed alongside another ship to prevent her sinking. She is not injured so much, however, but she can be repaired out there. The Commander-in-Chief shifted his flag into the Merlin, and proceeded to examine her immediately after the fleet had anchored. All communication with the Arrogant has been forbidden. May 7. - Two small trading vessal laden with hemp arrived here this morning ; they are prizes to the Geyser, who captured them off Riga. The Driver also arrived with despatches from the flying squadron to the Commander-in-Chief ; she left them last night cruising off Dageport "all well." We have beautiful weather ; only one slight shower since leaving Kiel ; the thermometer at mid-day in the shade ranges about 46. May 8. - This morning a Swedish frigate entered Faro harbour. In passing by the Duke of Wellington she manned her rigging and gave three hearty cheers, saluting also with 13 guns, which were returned with the same number by the Duke. The fleet is to sail this afternoon, most likely for Baro Sound. A signal has just been made, "Opportunity for letters to Engalnd to-day." The Driver will take them to Dantsic." The fleet layed at anchor for some days off Nargen for a few days, a place they left by May 26th (a departure delayed for 4 days by the fog), and "after a two days' cruise, anchored again about 16 miles below Cronstadt". The British fleet was joined by the French one on June 1st, "and were saluted with 21 guns by the Duke of Wellington ; all the English ships flying the French flag at the main." Admiral Dundas went on reconnoitring the waters around Cronstadt. Several Russian transports laden with stones for fortification were captured, and sunk with their cargo. A siege of Cronstadt being considered, the size of the ship-of-the-lines again was proving a problem : "the ships of which (the allied fleets) are composed are quite ineffective so far as relates to the bombardment of the enemy's forts, in consequences of their great draught of water. Not one of the larger class can approach the north side of Cronstadt nearer than two and a half miles, a distance tan times too great for the heaviest shot they can throw to produce any impression on the batteries". The presence of "Infernal machines" and torpedoes "which were last year looked upon as myths, have turned out to be realities, sown over every yard of ground over which the first division of the fleet is anchored". By the 21st of June 1855, the Royal George was among the second division, "anchored as a reserve in mid-channels". This period marks the end of midshipman Frederick Amherst's career on board the Royal George, and, it seems in the Royal Navy. There was eventually no attack by the combined fleets on Cronstadt - though Sweaborg would be attacked on August 9th. "14th Light Dragoons.-Hon. Frederick Amherst to be Cornet,without purchase, vice Phillips, promoted to the 18th Light Dragoons". By that time the 14th Light Dragoons had been heavily engaged in the Central India campaign. I do not know when and how Cornet Amherst joined his regiment, but it seems he was not to take part in the operations, as denoted by his not being awarded the Indian Mutiny Medal. The regiment was ordered to England in March 1859 - an order that was countermanded in May -and eventually embarked at Bombay, to reach Plymouth and be transshipped to Newbridge, Ireland, in June 1860. The 14th Light Dragoons were converted to Hussars on August 17th 1861. In May 1862 the regiment left Ireland to get to Manchester and around. Frederick Amherst purchased his Commission as a Lieutenant on October 13th 1862. "Four silver dessert-stand (oak pattern)" were offered to the officers' mess by Lieutenant Mather and Amherst, and captain Digby Boycott. In May 1864, the 14th Hussars went to Aldershot. Hon. Frederick Amherst was gazetted Captain "by purchase, vice Cecil Frederic Hobbler, who retires" on December 30th 1864. On June 7th, 1865, he was presented by Lord Sydney to the Prince of Wales at the Levée held at St. James's Palace. On May 14th, 1866, he attended the annual regimental dinner at Willis's Rooms, King-Street, St.James's. Among the officers present was also Cornet George Robert Elwes. In May 1867 the regiment left for Edinburgh and outquarters ; Captain Amherst's troop, 'H' troop, went with headquarters to Piershill Barracks, Edinburgh. The next year, they left back for Ireland, the scond Division ('A' and 'H' troops), undr Major Chadwick, reaching Newbridge on May 13th 1868. In November, a wing under Major Cahpman, consisting of 'B', 'E', 'H' and 'K' troops went by rail from Dublin to Cork. They returned by march route after the parliamentary elections, reaching Dublin on the 15th December. From the 1st April 1869 the Squadron system was introduced into the British Cavalry. Captain Amherst commanded the 4th Squadron, with Captain the Hon. J. St. V. Saumarez as a Second in command. One year later, the Squadron system was abolished and the Troop system reintroduced. In July 1870, the regiment was sent to Cahir and out-stations, 'H' Troop going to Clogheen. They changed stations again in 1871, Captain Amherst's 'H' troop going with Captain Beaumont's 'B' trrop from Cahir to Cork. The 1872 regimental Challenge Cup presented by Captain J.M.Lefroy (for leigth weight) was won by his horse "Exchange". On July 5th 1872, 'H' troop under Captain Amherst took up the vedette duty on the Curragh Camp in relief of a troop of the 8th Hussars. Another troop of the 14th Hussars took that duty over on January 1st 1873, and 'H' troop joined the remainder of the regiment at Newbridge. In April 1874 his horse "Prince George" (11st., 8lb. ), mounted by Mr. Kevil Davies, took part in the Irish Military Steeple-chase. Rated 6 to 1, it was not happy : "The lead was held for a short time by Bertram, followed by Waterford and Prince George into the course, where the last named went to the fore. This position he held over the hill, where Waterford went to the front, was not again headed, and won in a canter by ten lengths" - "Prince George" not even eventually finishing in the top three. The regiment moved from Ireland back to Aldershot in May 1874, Captain Amherst being in command of the second divisions, consisting of 'H' and 'K' troops, and embarking in SS.Windsor at North Wall, Dublin, on May 22d, for Birkenhead, and proceeding by route to Aldershot. During the 1874 Aldershot summer manoeuvres, he was appointed baggage-master to the Cavalry Brigade of the 1st Division. He will hold the same appointment to the Cavalry Brigade in the 1875 Aldershott summer manoeuvres. Frederick Amherst attended the levée held by the Prince of Wales at St. Jamles's Palace on April 26th 1875. On July 26th 1875, 'A', 'B', 'C', 'H' and 'K' troops marched to Colchester, arriving on July 31st. There the regiment received orders to prepare for embarkation for India. On December 17th, 1875, he retired from the Service, "receiving the value of his commission". The 14th Hussars sailed for India on board the troopship Euphrates on January 5th 1876. 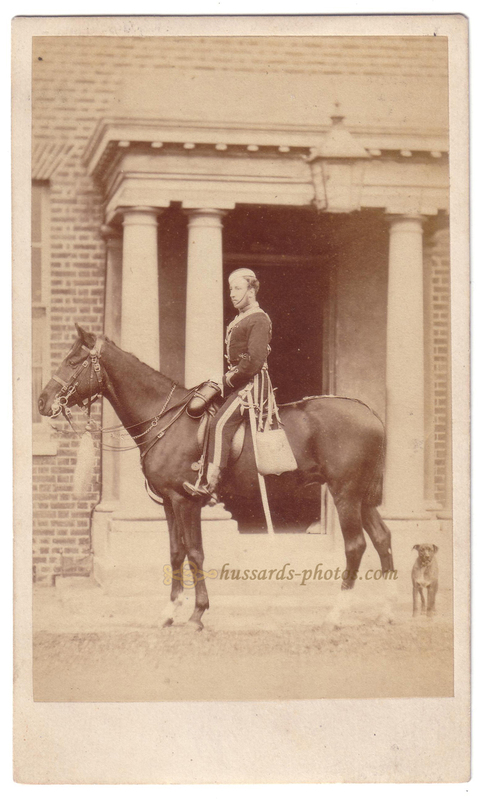 Frederick Amherst was commissioned a Lieutenant in the West Kent Yeomanry on February 26 1876. He resigned that appointment on February 16th, 1881. He died on March 15th, 1895, in Montreal, Sevenoaks, Kent.